This July in the main gallery we feature the work of core artist Shao Yuan Zhang and guest artist Fafnir Adamites. Unturned will open to the public on Thursday, July 5th with an opening reception on Friday, July 6th from 6-8 pm. The show highlights a variety of each artist’s work, including oil on canvas and sculptural work in plaster and paper. Unturned conjures the idea that we are shaped, but unchanged by outside forces, and persist in the face of adversity. It is what makes us human. These are the fundamental and inevitable forces that drive the work for this show. Shao Yuan Zhang’s energetic oil paintings of stallions explore and illustrate movement through nature. His work represents his immigrant journey, and moments of his Chinese self-identity intersecting with the surrounding American culture into which he wades. Zhang incorporates both contemporary – watercolor – and traditional – ink calligraphy – painting styles in his work, blending notes of energy, optimism, eagerness, hunger, and naiveté with strokes of indifference toward the societal obsession with materialism over nature. Zhang reconciles the traditional style he learned as a woodcut artist crafting propaganda art for the communist party during the Cultural Revolution with the contemporary technique he learned in the U.S. He has participated in numerous exhibitions, including a show of portraits at the famed 798 Art District in Beijing, and several international exhibitions including Chinese National Art Exhibitions. He studied at the Central Academy of Fine Arts in Beijing and holds an an MFA degree from the University of Utah, where he taught drawing and painting for more than 20 years. "For me, the title Unturned relates to the ways in which we can absorb the influences around us but maintain our own path in light of this influence. I'm very interested in Trans generational Epigenetic Inheritance, or inherited damage. This theory that anxieties and traumas are embedded in a person’s DNA and are then passed down to the next generation is a major motivation in my artwork. My sculptures in this exhibit explore the ideas of outside or phantom influence and finding and trusting your own intuition. I am also highlighting the passage of time, development and obstruction in my sculptures. These concepts are formed through my use of materials and process." "Paper is a chaos structure which is made up of countless fibers, all melding together into one cohesive form. There is no order within this material. 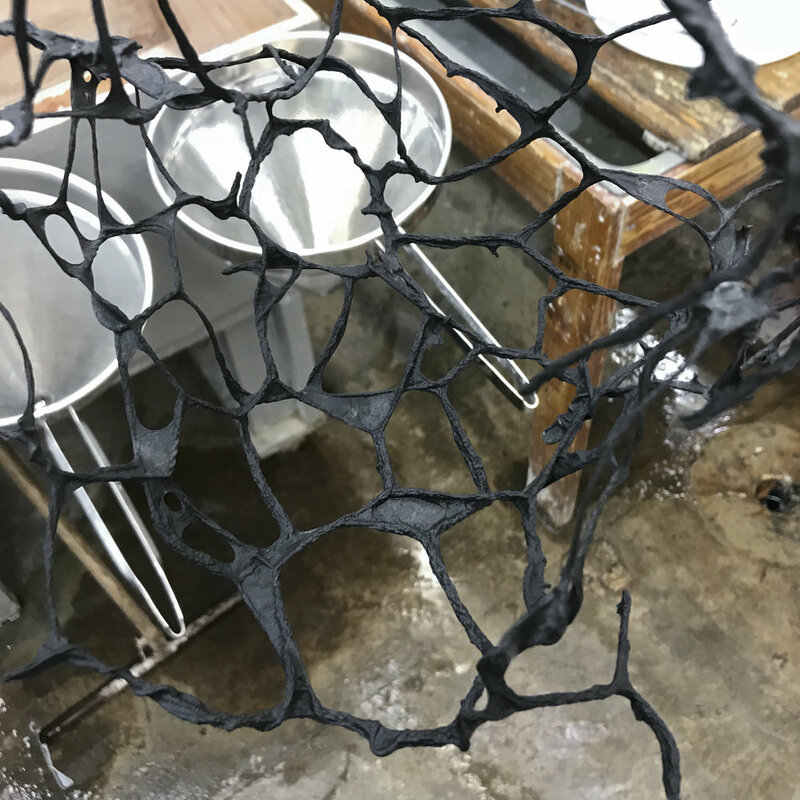 Pairing this material quality with the repetitive nature of dipping sculptures into paper pulp or accumulating a number of similar forms helps me to physically manifest the concepts of chaotic trauma, repeating someone else's traits and the cyclical nature of internal thought."